I was sorry to leave Hyder. It's a swell place to hang out. And it certainly has more bang for the buck per square mile than just about any place that I've been. Before I forget, if you're going to make this trip, don't buy the National Geographic Road Atlas. They left out a big chunk of British Columbia. I've traveled without a real road map for days. All week I had been debating about whether to drive on up into Alaska or not. Just looking at the map and planning it on the fly was overwhelming, so I sto pped gnashing my teeth about the whole thing and turned west toward the Pacific. I really had no idea where I was going. I took a back road off of 37A so that I could tour the Nisgaa Memorial lava beds, and made one of the biggest blunders of the trip. For about 40 miles I followed a pen mark that I had made when I was doodling on the map. Don't doodle on your maps. Treat them with the respect that they deserve. I kept driving and driving a miserable washboard road expecting pavement when there was none. I was stuck on a logging road for hours. An active logging road. An active logging road that they were in the process of grading. I bit off every fingernail that I had and was ready to start working on the toes when I finally was dumped out onto pavement. And it was almost worth it. The open areas of the lava beds are quite eerie. It's like Frank Slide; you know that underneath all of that there are people and lives suspended in time. It's a weird thought. The lakes and rivers throughout are very beautiful. They all look like little Japanese Gardens. 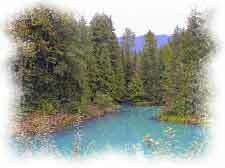 The water is an exquisite shade of turquoise and the evergreens gracefully waft into them. There are tiered waterfalls everywhere and little jeweled pockets of wildflowers tucked in all around. I spent most of the day in there wandering around. It was peaceful and inspiring. Is that a contradiction in terms? I think not. I got into Terrace, B.C. quite late and replenished the supply cache, then drove straight for Lakelse Lake, about 20 miles south, because I knew that it was close. I checked in, unloaded the car, cleaned, and repacked everything. The place was full of kids on bikes. Thousands of kids. It's a pleasant park, but crowded. The showers worked great and they were free. YAY!!! 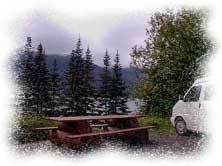 I had planned to drive on down to the Hot Springs, and then on to check out Kitimat, but I decided n ot to. I was ready for some ocean, so the next morning I drove on into Prince Rupert. It was a beautiful drive, and I think I only passed about 10 cars on the road the entire trip. Prince Rupert is kind of a pretty little town. It's hilly and from just about everywhere you can look out onto the water. The harbor is very active, and it's an interesting place to just walk and watch. There is a city walking tour map that you can pick up at the visitor information center. There is a great museum (with an excellent gift shop/book store) housed in a building suggestive of the First American Longhouses. There is also a railway museum that I did not have time to visit, but it looked quite interesting. It's housed in Kwinitsa station, which was built in 1911. The station was moved there from it's original location on the Skeena River. I filled the gas tanks (regular and propane) and found a small Asian grocery, where I loaded up on goodies. And there's a nice Publix in town with great produce. Then I went and did my laundry. If you need to do laundry in Prince Rupert, don't go to the big laundromat that advertises everywhere. Go to the little one across the street. No crowds, it's immaculate, and the young woman who manages it is very very sweet. I camped for the night at a campground in town that is about 5 minutes from the ferry. Cramped, no privacy, unlevel sites, but GREAT showers. It's all a matter of priorities, eh?